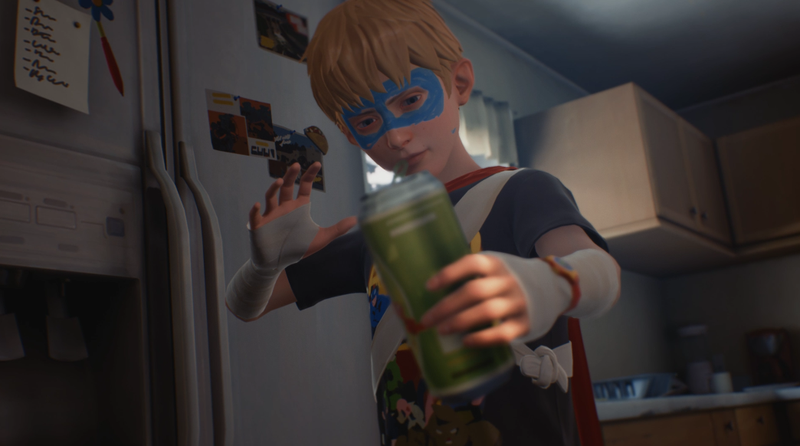 In The Awesome Adventures of Captain Spirit, nine-year-old Chris Eriksen sets up a tower of his father’s beer cans for his superhero alter-ego, Captain Spirit, to blast into the abyss. He had to practice his aim for that day’s big, imminent fight against his arch nemesis, Mantroid. While his dad slept in a drunken stupor, he took out the recycling, briefly suffering a whiff of the sour smell of stale beer. In Captain Spirit, released yesterday, a superhero always finds good use for a garbage situation. Captain Spirit is a two-hour, free adventure game by Life Is Strange developer Dontnod. Released in anticipation of September’s Life Is Strange Season 2, Captain Spirit is both an offshoot and a standalone about Chris Eriksen, aka Captain Spirit. It’s a playful, melancholy story about an unattended kid’s Saturday make-believe adventure that’s hiding a few too-real gut-punches. In proper Life Is Strange style, the player gleans details about Chris and his father’s home life by picking up and interacting with items like dinosaur toys, trophies, letters and firecrackers. The player meets Chris and his superhero idol Captain Spirit on a snowy Saturday morning in Chris’s room, which is littered with figurines and comics. Chris is illustrating Captain Spirit’s costume, which, depending on what the player chooses, involves light or heavy armor, a mask or a helmet. He’s also practicing Captain Spirit’s psychic matter-bending powers. His father, in the other room, is cooking a disappointing breakfast of scrambled eggs. During his day, Chris has a number of things he can do: assemble his superhero outfit, play a mobile game on his dad’s phone, meet all his superhero allies, fight the wretched snow monster, find buried treasure. From there, the story poses and unravels a slew of dark questions: Where’s Chris’s mom? Why is his dad drinking so early in the morning? What is that bruise on Chris’s arm from? Why is the house small and in disarray? Small puzzles and found clues come together to form a heart-wrenchingly sad and mirthful story about escaping a troubled reality. Captain Spirit elicits a surprising range of emotions in a brief and refreshing two hours. As a soft Sufjan Stevens track plays, it’s hard to look out of Chris’s tree fort without feeling some childhood pangs. When he grabs his dad’s car keys, I felt a small, adultish fright. Then there are trivially fun story arcs like the battle of Power Bear and Noctarious, two toys on Chris’s floor. Without giving too much away, Captain Spirit does a hell of a lot with a little bit of time. And anybody looking to kill a few hours with a good, fresh and thoughtfully-made story game could not do better.